In Sri Lanka New Year is celebrated on April 14th (This varies from year to year according to the Hindu and Buddhist calendar). In Tamil it’s called “Puthandu” (புத்தாண்டு) and in Sinhala it’s called “Avurudu”. The exact time New Year born (auspicious time) is given by the astrologers. So the New Year is a very complex tradition based on the astrological, Hindu and Buddhist traditions. This New Year is also celebrated in parts of India. 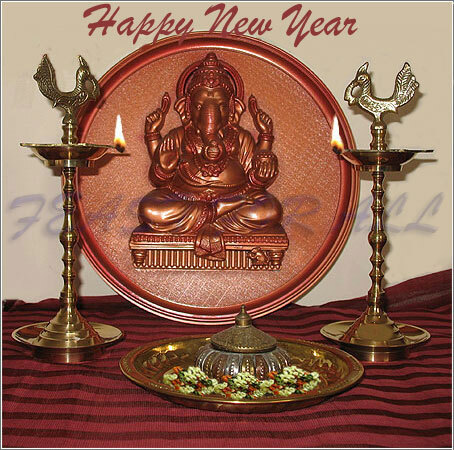 On this day every body says “Puthandu valthukkal” to each other which means Happy New Year. In Sri Lanka, Hindus follow some rituals for good luck and for the well being in the coming New Year. Hindus go to temples prior to the auspicious time (Punya kalam) and get “maruthu neer” from priests. They take bath with this “maruthu neer” by placing some water on the head. Traditionally some plant leaves also used while doing this ritual. “Kontral” leaf is placed on the head and “Vilvam” leaf is placed on the foot while taking this bath. After this new clothes are worn and once the New Year is born families assemble for prayer at their home. The prayer begins with lighting the traditional lamp (Kuthu Vilakku). Then the whole family heads to the temple for puja and prayers. The first financial transaction is known as “Kai vishesham” where elders give money to young people as a good luck and blessing. Sweet milk rice is cooked and other sweets are also made and the whole family sits and enjoys the meal. People also visit their relatives and friends and take sweets when visiting. A game called “por-thenkai” (coconut throwing between groups) is played by young boys/youth in villages especially in the northern part of Sri Lanka. Bullock Cart races (“maattu vandi chavari”) also held in villages on the New Years day. Folk dances like “Kolattam”, “Kummi” also takes place in villages.